We have added eight new video tutorials to our Support section. These videos make up four new sections of the tutorial video area: Installation, Reporting, API, and General. Watch this video to learn how to download and install each OnTime application on the appropriate device. OnTime applications are always kept up-to-date with the latest technologies and user needs. This video will walk you through the process of updating your applications when new updates are available. This video will help you to better understand your reports in OnTime, and to learn how to customize those reports. This video shows how to generate report databases, which is necessary to create custom reports. 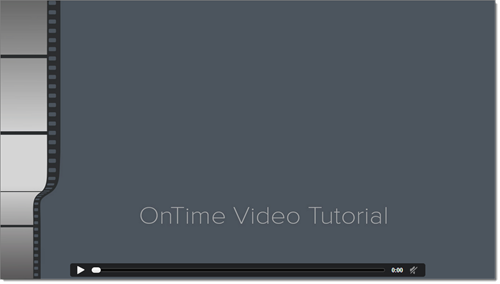 This video will introduce you to the OnTime API, and show you how to make use of it, in 5 minutes. If you wish to connect your OnTime account with third party software, this guide should be among your first resources. This video will help you to plan and execute your desired actions when using Microsoft’s Visual Studio with the OnTime API. The Import Data feature allows you to input large amounts of information into your OnTime account, automatically. Many users find this feature quite helpful and make frequent use of it. This video will help you understand how to import your data quickly. If you ever wish to upgrade or downgrade your subscription plan, you can follow the simple steps in this video to do so. Are there other OnTime tutorials that you would like to see? Leave your thoughts in the comments section below, or contact our team. Your dispatchers and drivers can communicate better with one another and achieve better organization by using the OnTime Dispatch and OnTime Mobile applications. These applications work together to enable drivers and dispatchers to assign and deliver orders more efficiently. Tools such as user tracking, the unassigned queue, and messaging can help to facilitate better organization and communication in your company. From within the OnTime Dispatch program, a range of driver information is available to help make quick and appropriate driver assignments. Your drivers’ last location can be viewed on a map, which is updated every 60 to 90 seconds. If your drivers do not have GPS-enabled mobile devices, their last location is also available from the Driver List. Your drivers’ online or offline status will also be shown. A manager can setup occupied zones from OnTime Management Suite, which will allow dispatchers to reference drivers’ expected locations for the best assignments, any time. Once an order assignment has been made by your dispatcher, the assigned driver can accept the order and view its' details from OnTime Mobile. Information about unassigned orders, current orders, order assignments, and more is available to your drivers from the mobile app, helping them to prepare for, collect, and make deliveries quickly. If the appropriate notifications have been setup in OnTime Management Suite, your driver may receive an alert when they are assigned a new order. Dispatchers can also send one-time messages to drivers, informing them of order submission, updates with orders, or any other necessary information. These messages can be sent by SMS or email by right-clicking on the driver who should be messaged in the Driver List. You can test OnTime Dispatch and OnTime Mobile with our 14 day trial version. If you are already an OnTime subscriber, you can download the applications here. Each user of your OnTime account may download and install the applications on every device that they use. OnTime provides an array of customer service tools, including the customizable OnTime Customer Web Portal. You may place a log in form directly on your website, or post a link, to give your customers access to order entry, price quoting, real-time tracking, and other tools. OnTime and the Customer Web Portal are always updating and adding new features, so you can be sure that you are always providing the best online customer service. The OnTime Customer Web Portal gives your customers the ability to create their own orders, at any time and from anywhere. They can enter an order’s information to submit the order into your system, or to simply generate a quick price quote. When entering an order into OnTime via the Customer Web Portal, your customers will be able to enter locations, as well. A personal address book will be available to each customer, containing the locations that they use. These locations will also be available to your dispatchers for quick order entry. Customers can track their current orders and view past orders from the Tracking section of the OnTime Customer Web Portal. Tracking information, such as assigned driver or recipient signature, can be viewed from here. The tracking section will display order information in real-time, so your customers can find out where in the shipping process their order is at any time, without needing to contact you. Other features, such as report generation, are available to your customers with your OnTime Customer Web Portal. For more information, see the customer feature list. For customers that would like a user guide for the portal, we have prepared the OnTime Customer Web Portal User Guide. Freely distribute this document to your customers so that they can take full advantage of your portal. The Customer Web Portal is included with OnTime Enterprise accounts. To test the portals’ functions and features, sign up for a 14 day OnTime Trial. OnTime courier software is available on a subscription basis with no contracts or long term commitments required. We have designed our four subscription plans to scale to fit with and to meet the needs of most delivery businesses. Every plan comes equipped with our 30-day Customer Satisfaction Guarantee. Compare the plans’ features in list form here. The OnTime Basic plan has been designed to keep costs minimal, while providing you with a variety of integral features that will improve your company’s efficiency and management. You also receive unlimited technical support from our expert team via email and full access to our extensive support library. Dispatching, order entry, messaging, pricing, and tracking features are all available to you and your dispatchers with a Basic subscription. The WAP OnTime Mobile application will empower your drivers to connect with the rest of your company, encouraging them to improve internal communications. The Basic plan is recommended for smaller or start-up companies that require courier software functions and features on a day-to-day basis. The Standard plan includes all of the Basic plans’ features, applications, and services. Your Standard subscription also includes more OnTime Mobile applications and features, as well as the addition of unlimited telephone support from our Customer Support team. The Standard plan is recommended for companies that require drivers to complete numerous and varied tasks daily, while maintaining communication with other staff members. The Professional plan includes everything that the Standard plan accesses, plus more employee time tracking options and route features. The Professional plan also comes equipped with QuickBooks integration, which offers you several complex invoicing options. The Professional plan is recommended for companies that require detailed company records and prefer quick, easy access to that information. The Enterprise subscription plan is equipped with the Professional plan’s features and functions. The Enterprise plan also includes vehicle management, report authoring, and data mining features. The OnTime Customer Web Portal and the OnTime API ( based on SOAP based XML Web Services) come with the Enterprise plan, as well. The Enterprise plan is recommended for businesses that require advanced courier software features and extensive company records. Enterprise subscribers often wish to provide high quality, automated customer service tools to their customers. To use OnTime Mobile, you will not need to purchase new and expensive phones or tablets. Because of our extensive compatibility, your drivers can likely use the OnTime Mobile application with the devices that they already have and know how to use. OnTime Mobile runs on 7 different platforms, including BlackBerry, Windows Mobile, and Android. Our notification features can even be used with pagers. The WAP version of OnTime Mobile will work with virtually any phone with the internet and a browser, while the Web version is compatible with most modern smartphones and tablets. Management and dispatching staff can access OnTime Mobile functions and features directly from the OnTime Management Suite and OnTime Dispatch desktop applications. This way, managers and dispatchers who perform test functions only do not need to install the app on the mobile devices at all; they can access the features from their desktop computers. Give your drivers access to the tools that they need to complete their assignments and communicate effectively with OnTime Mobile. From their current devices, they can access company data in real-time for up-to-the-minute information. Our continuous updates to the OnTime Mobile application ensure that it is always functional and useful for your delivery business. The application is included with your Standard or higher OnTime account and available to all of your users at no extra charge. Find out more about OnTime Mobile installation here. Your OnTime account is made up of a series of lists, which contain all of the data pertaining to your account. These lists are made up of records including your customers, zones, locations, and orders. You may import data into these lists to move bulk amounts of information into your OnTime account. Map the appropriate fields from your document to the corresponding fields in OnTime to guarantee that information is populated where and how you want. Or, if you've already set up your fields appropriately, you may be able to right-click and use the OnTime’s Auto Map Fields function to quickly assign those fields correctly. Custom fields may be created in OnTime to identify information that is important in your company, but not included in OnTime by default. Mapping your data to these custom fields with the import feature can help you to distribute your information easily and effectively, as you require. 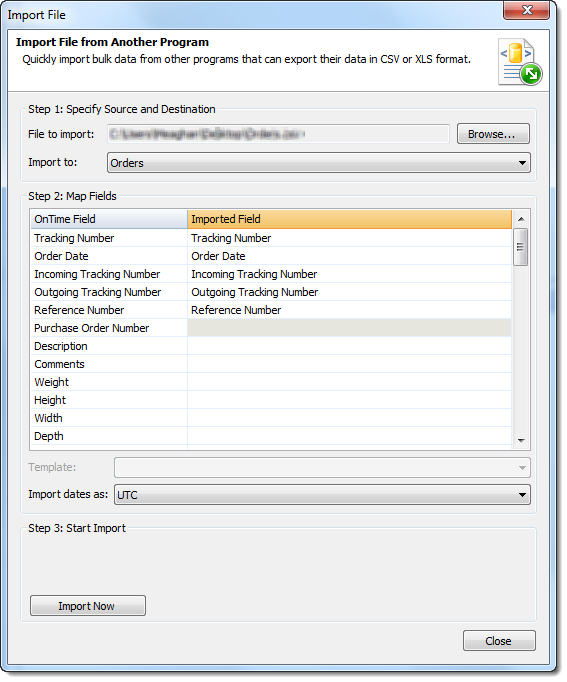 Excel and CSV file formats are compatible with OnTime’s Import Data feature. With features such as bulk data import, we hope to improve your day-to-day efficiency from the very beginning of our relationship. Importing your data in bulk will allow you to move your information from ASNs (advance shipment notices) and other customer files into OnTime automatically, ensuring quick and effective account maintenance. 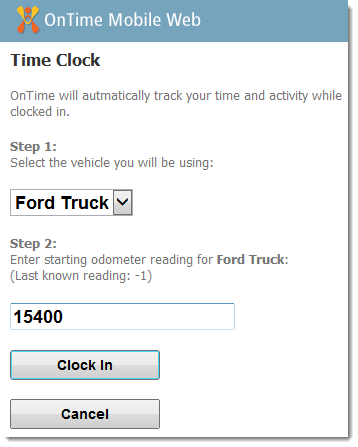 Start your fully loaded OnTime Trial today to begin testing this feature. Refer to the OnTime User Guide for detailed instructions regarding customer, zone, location, and order data import. Your courier company must track and manage various information about the orders that you process. OnTime communicates with QuickBooks by Intuit to help you to manage your invoices and information in both OnTime and QuickBooks. The invoices that you post to QuickBooks can be customized from within OnTime. You can post one or more invoices to QuickBooks from the Billing area of the OnTime Management Suite. Information is sent to QuickBooks with your invoices, such as Tracking Number, Delivery Location, etc., can be adjusted as you wish. Assign QuickBooks fields to their corresponding OnTime fields. If a match is not found, OnTime can create new entries for you automatically. You may choose to have OnTime prompt you before creating a new record when a match is not found. You may also choose to have OnTime alert you when an invoice has already been pushed to QuickBooks. Optionally, prices on your invoices can be automatically updated when they are posted to QuickBooks. This will cause the invoice to show your current price modifiers and price sets. 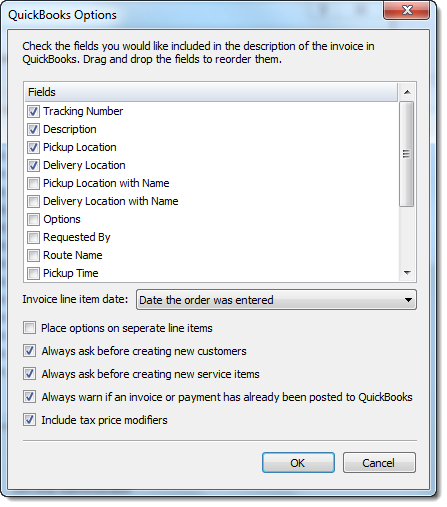 Tax price modifiers can be hidden or shown on invoices posted to QuickBooks, as you desire. The Invoice line item date may be set to reflect either the submission date or the delivery date of the shipment. 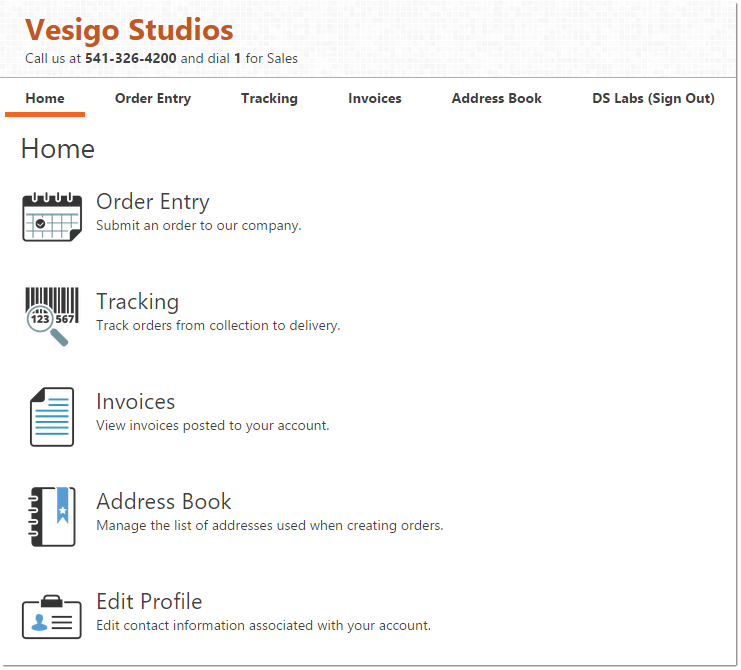 A new line item can also be set to be created on the invoice for each order and for the base price of the order. Then, a new line will be created for each price modifier, with individual prices listed. OnTime can connect with QuickBooks Professional 2002 versions and higher. OnTime helps to facilitate efficiency across your organization by communicating with third party programs, such as QuickBooks. Other programs can be communicated with via the internet using the OnTime API. To find out more about posting invoices to QuickBooks from OnTime, see the OnTime User Guide and the OnTime Knowledge Base. OnTime courier software works with you to maintain and manage your delivery company simply and automatically. Because your attention needs to be focused on your business, not troubleshooting, OnTime also helps to maintain and manage its own functionality using simple and automated methods. Troubleshooting tools and support resources are available directly from the OnTime Management Suite and Dispatch applications to immediately address any issues that you may encounter. If you experience issues with new OnTime features or synchronization, Data File Management is available from within OnTime Management Suite and OnTime Dispatch. If your network is causing issues with OnTime’s performance, the built-in network diagnostic tool is available. The source of the issue can be found by running this test, and Vesigo technical support can help you resolve the connectivity issues. Any other support resources that you may need are also available from the programs. Our support center, website, tutorial videos, contact pages, and more can be found in the Help tab. If you ever encounter an issue with OnTime, we’ll help you to rectify that issue as quickly as possible. See the Tips and Troubleshooting section of the OnTime Knowledge Base or Chapter 9 of the OnTime User Guide for step-by-step guides to help you quickly troubleshoot issues. If you require personal assistance, contact OnTime technical support. Unlimited technical support is available to all OnTime subscribers. Our online support resources are available to all OnTime subscribers and trial users. Efficient and consistent timing is integral to your delivery business. Properly setup schedules in OnTime delivery software can help to ensure the most potential efficiency and productivity possible for your company. Be sure to test all of your schedules in OnTime before implementing them, to check that everything is working as expected. Manual testing can be time consuming, which is why OnTime offers testing options for Customer Billing Cycle and Route Stop Schedules directly from the schedule setup screen of the OnTime Management Suite. This simple and straightforward method of testing can help you to ensure that your delivery business automatically runs how you intend. 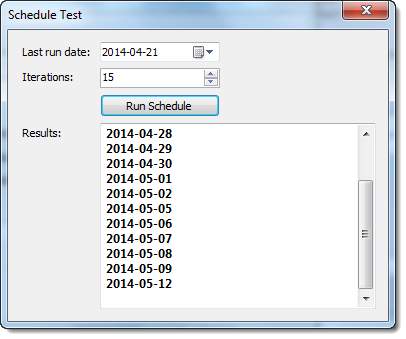 OnTime schedule testing can be accessed from billing cycle and route stop schedule screens by pressing CTRL + ALT + T. You can enter specifics for your schedule test in the resulting window. 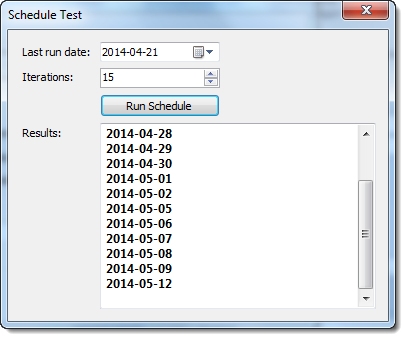 Once your run your test, a list of dates will appear. These dates can then be compared against your intended results. If dates are not included and excluded as desired, you will need to adjust your schedule. This in-program testing method will allow you to verify your OnTime schedule accuracy in a few seconds, instead of the hours, days, and weeks that manual testing can take. For detailed instructions regarding Customer Billing Cycle Schedule testing, see this article in the OnTime Knowledge Base. For instructions regarding Route Stop Schedule testing, see this article. To find out more about setting up schedules, check Chapter 4 of the OnTime User Guide. Your fleet of vehicles is a large contributor to your courier business’s success. As a part of managing your business, OnTime helps you to schedule and track the maintenance of your vehicles. Better manage your company, employees, and vehicles by setting up your preferences ahead of time, then allowing OnTime to help automate your day-to-day. Categorize the vehicles in your fleet by inputting custom Vehicle Types. 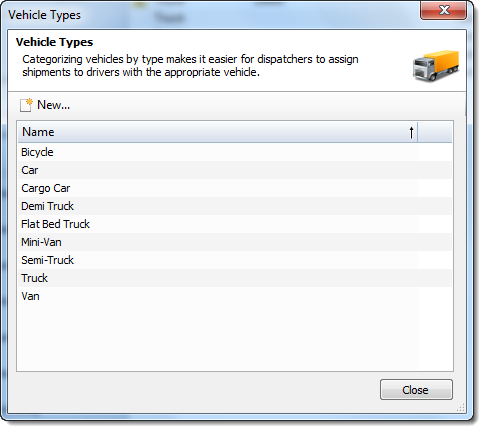 When assigning orders, drivers can be organized based on the Vehicle Type that they are using. That vehicle can then be compared against the shipment’s specifications to ensure that requirements are met and the shipment is completed. Maintenance items can be created and associated with vehicles to schedule preventative care, such as oil changes and tune ups. 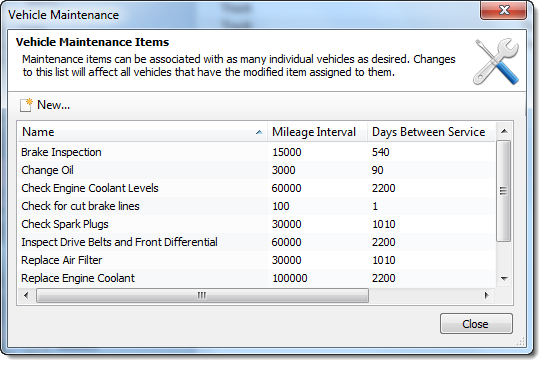 These items are scheduled and tracked based on the associated vehicle’s mileage since the last maintenance, time based since the last maintenance, or whichever comes first. Once maintenance has been performed on a vehicle, record that in OnTime to update that vehicle’s schedule. Setting up maintenance items and schedules will allow OnTime to automatically help you to manage and schedule care for your fleet. 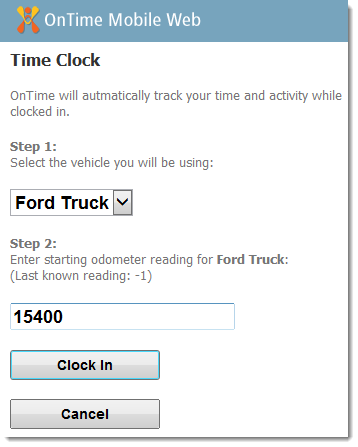 When your drivers clock in using OnTime Mobile, they can enter their Vehicle Type and odometer reading on the resulting screen. You will be able to keep track of both vehicle and driver activity with more accuracy, as individual OnTime Mobile user mileage can be tracked. Additionally, your dispatchers can reference the Vehicle Type that a driver is using to ensure that shipments are properly assigned. 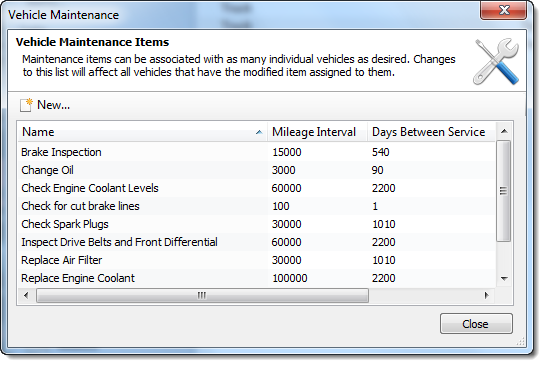 Information about setting up and using OnTime’s Vehicle Management options can be found in Chapter Four of the OnTime User Guide. To get started, download the latest version of OnTime Management Suite and sign in with your account, or start your trial.